A small earthquake rattled much of central New Hampshire Monday morning. 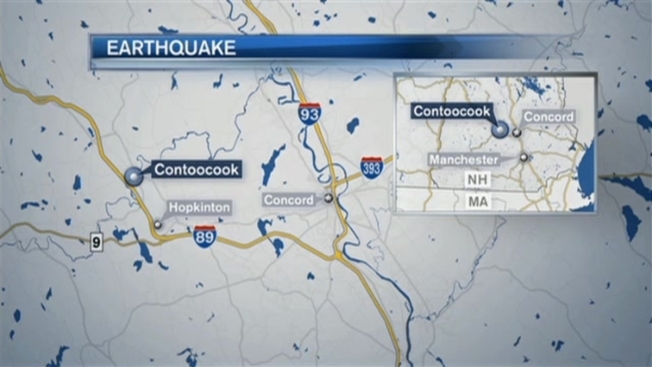 The Weston Observatory said the quake struck at 9:18 a.m., and was centered in the Warner and Hopkinton area. The disturbance registered a 2.9 magnitude, which is considered minor for earthquakes. There were no reports of significant damage. "Very few earthquakes have any sign from a smaller earthquake that it would be leading to a bigger earthquake," noted Alan Kafka of the Weston Observatory. Kafka said it is possible Monday's quake was actually an aftershock to a much more significant earthquake that happened centuries ago, in the year 1638. "There are seismologists who think they have found faults in the subsurface in that central New Hampshire region, and there are seismologists who question that," Kafka said. "That's kind of at the forefront of the research." At the Everyday Cafe in Contoocook, the quake was a main topic of conversation Monday. "I heard it before I felt it," remarked cafe customer Ron Klemarczyk, who noted he learned details about the quake's impact by watching meteorologist Matt Noyes on necn. "It sounded like a sonic boom." "It probably lasted four to five seconds long, and on a scale of 'Well, that was an earthquake,' that felt like a long time," added cafe customer Betsy Spencer. Several people who experienced the quake remarked they or their spouses or friends originally thought they had heard a large vehicle crash. "I was watching TV and all of a sudden, I jumped out of the recliner," recalled Kristi Cressy, another Everyday Cafe customer. "I was like, 'What's going on?' I looked at my husband and he's like, 'Oh, it's just a plow,' and I'm like, 'That wasn't a plow.'" "It snowed, and now we have an earthquake-- it's a really crazy first day of spring," laughed restaurant employee Kim Blank, who expressed relief that no serious damage was reported. In Warner, Pat and Kevin Trader recalled their home briefly feeling like it was shaking, with a boom loud enough to wake up Kevin. "I thought it was maybe thunder or something," Kevin Trader told necn. "You hear about earthquakes happening out in California, and to actually experience it yourself here in New England was kind of like, wow," added Pat Trader. "You could feel the rumble, you could feel the vibration, and you could hear it," recalled Susan Montminy, who said she experienced the quake in a hair salon. "It was almost like someone had hit the building, which is what I thought," added Jessie Bouthillette, who was also in the salon. "A little shake and it was like, 'wow!'" While Warner and Hopkinton got a dusting of snow Monday as well, much of it had melted by mid-afternoon. Kim Blank said the memories of the earthquake will surely last longer than the snow did. Just felt a huge #earthquake in #Davisville, NH. Probably not big but very close.